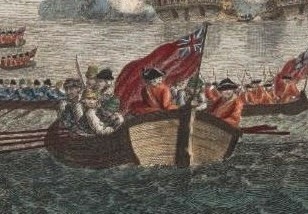 A View of the Landing of New England Forces in ye Expedition against CAPE BRETON, 1745, F. Stephen, 1747, Wikimedia Commons. During the War of Austrian Succession (also known as King George's War or, more hilariously, the War of Jenkin's Ear) colonial soldiers from New England embarked on an expedition to besiege the French fortress at Louisbourg. 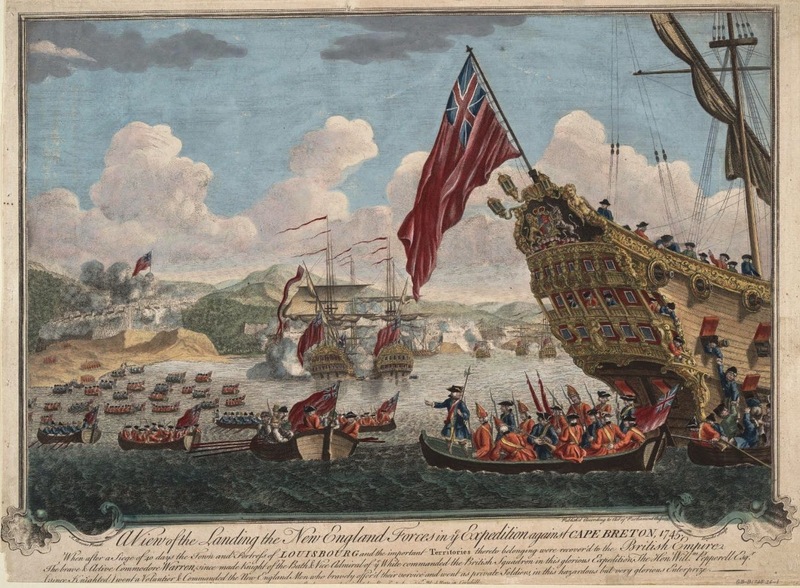 This print depicts the dramatic moment when, under the cover of the Royal Navy's thundering cannon, those American troops set foot on Canadian soil. The siege was successful, and the fortress became an important piece in the game of international diplomacy that eventually ended the conflict. You'll notice that a good number of these boats have no sailors in them, or even oars. This is quite unlike our previous posts that clearly show the oarsmen alongside the lobsterbacks. In this case, the boats do not appear to have been designed to carry troops, and so do not have the room to accommodate both soldiers and sailors. 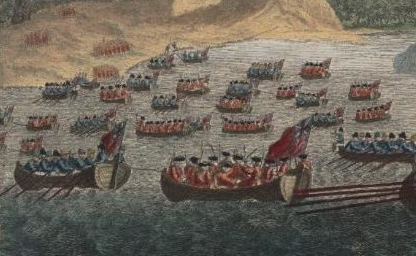 Instead, two boats are tied together with the troops being loaded into one and dragged by the sailors in the other. 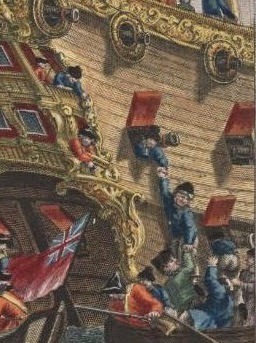 The above image has little detail, but we can say that the sailors are wearing blue short jackets and probably round hats or jockey style caps. This boat is crammed with tars who lack any jackets. The hats are a bit more clear, though the nature of the black hat is still a bit indeterminate. Most of them wear knit caps, including one fellow with a green and gray striped knit cap. They appear to be wearing waistcoats, but it is hard to say anything more definite about them. 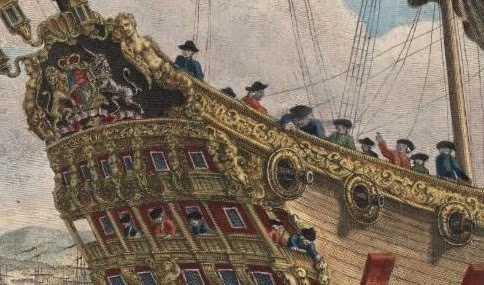 On the stern of this wonderfully decorated vessel are a good number of men. It is difficult to tell who are soldiers and who are sailors, though I can say with some confidence than the man furthest aft on the quarterdeck is among the latter. His is a round hat, he shows no significant length of hair, and his jacket is a single breasted blue. Climbing from the gunport is another sailor, being helped down into the vessel by his mates. One of them wears a cocked hat and green short jacket, though the rest wear blue. Another tarpawlin climbs into a gunport, and is the only one who gives us a good view of his trowsers. These are long legged garments, and clearly not the broader legged slops.